Kathy “KD” Frueh is the President of the wildly successful dog toy company, KONG. She was born and raised in the Midwest, and went on to receive her BA from Bethel College and her MA at the University of Denver. She served as the Director of Admissions at University of Denver for a decade. She then took the helm at KONG, 15 years ago, and has played a key role in the corporation’s international success. 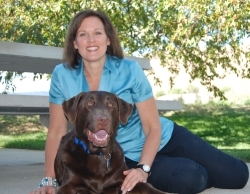 She lives just outside Denver with her family, her husband Doug, two sons in college, and a Chocolate Lab named Dakota.